By Mark Engleman, Engleman Associates, Inc.
We of course are referring to Enterprise Resource Planning software. Or ERP. For a manufacturing firm, it’s that big software application that plans production materials, takes customer orders, conducts purchasing, production planning, inventory control, accounting, and much more. The average ERP license, or ERP Cloud subscription price, is about double what should be paid. And this cost overage typically gets worse over time—especially with Cloud ERP. The following are our top five purchase details to get right to achieve large initial and ongoing cost savings when accessing ERP. You must get it right at the start: Reaching a great initial discount is good, but eventually this will be meaningless unless strict ongoing costs control terms are put in place. ERP sellers know that once a customer is ‘captured’ the seller now controls the relationship. Therefore to have real cost control over time it is critical to arrange cost escalation terms based on the original low access costs. Further effective terms and costs should be arrange for accessing additional user/device access or modules for at least two years from initial purchases. This done well saves large amounts of cost over time. What should you buy? ERP is complicated and it is often hard to get accurate information from sellers. So costly mistakes are often made in purchasing access to ERP. 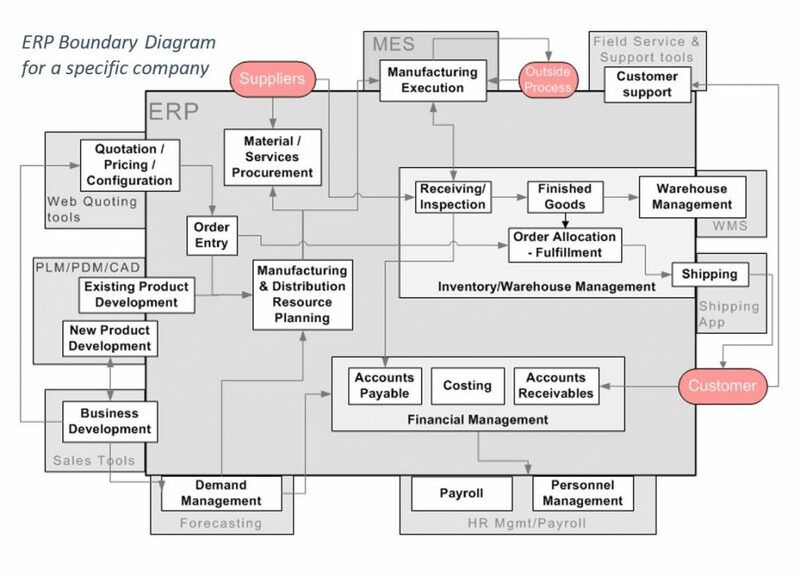 To control this, buyers should strive to be clear on what ERP functionality should reasonable cover (see the sample ERP Boundary Diagram). Then buyers need to spend time carefully understanding the various ERP access dimensions, such as ‘User’, ‘device’, ‘location’, ‘modules’, and others. This process also helps establish what software access is needed now or needed later. Shared full user ERP licenses: A modern ERP, properly implemented, should occasionally have all full license ERP users in the ERP one time. This 100% usage kills the utility of the shared license. Therefore be careful when being offered shared licenses that carry a higher cost based on the assumption of a high sharing ratio. Retire unneeded software access: Arrange terms to retire software no longer used and the associated ongoing cost tied to this software. Options to trade the value of the retired software for new software can be even better. Contractual landmines: ERP access contracts typically have multiple ways to confound cost control objectives described in the first four steps of this blog article. So the proposed default contracts and other legal documents must be scrubbed for such issues. An upcoming blog article in this series will list the top five contract issues that render ERP buyers literally defenseless in such a commercial relationship. The experiences and results of hundreds of ERP software selection projects and continual interaction with the ERP software vendor community is the basis for this article. Follow this link for more information on effective cost control techniques when accessing ERP for your company.